Here is a recipe from allrecipes.com. It is one of the best recipe sites on the internet in my opinion. Recipes are rated by members and if you choose a 4 or 5 star recipe you have a pretty good rate of success. In my organic produce box, I had a nice head of cauliflower. I don’t LOVE the vegetable, but this recipe is good. I think next time I will add cooked crumbled bacon to the dish just before broiling the Parmesan cheese. My husband supports that idea, as all things are made better with bacon! I did not have fresh parsley on hand and omitted it. For the original recipe click on the allrecipes link above. I included the change with the bacon (which I didn’t actually do this time, but think it would work nicely). Preheat the oven to 450F. Spray a casserole dish with cooking spray. Combine the minced garlic, olive oil and cauliflower in a large zip-lock bag and shake to mix. 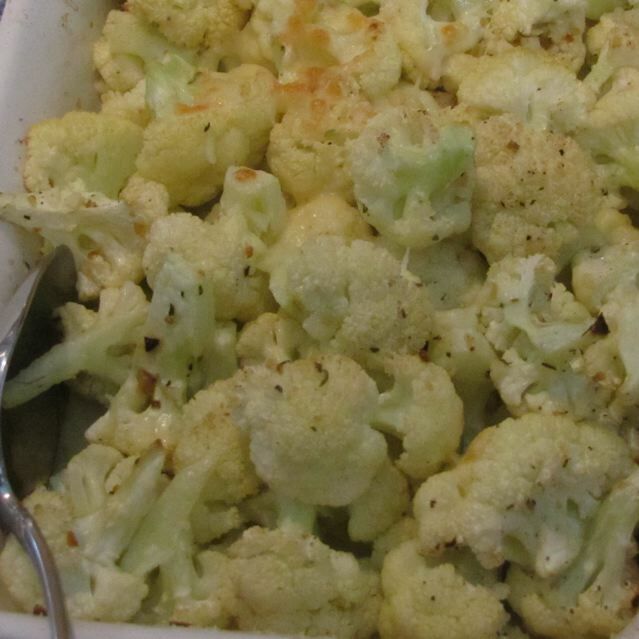 Pour the cauliflower into the casserole dish. Season with salt and pepper. Bake the cauliflower for 25 minutes, stirring half way through cooking time. Stir in the bacon crumbles and top with Parmesan cheese. Broil under high broil for 3-5 minutes, until the cheese is golden. Looks good, I’m going to try this!